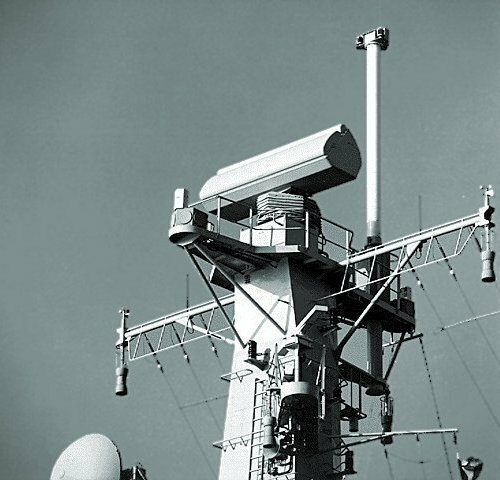 SMART-S (Signaal Multibeam Acquisition Radar for Targeting) is an all-weather 3-D target indication and surveillance radar system intended for all types of naval vessels from fast patrol boats upwards. Its prime application is as the main sensor for data handling and weapon system control, and it has a very high performance in the presence of heavy clutter and electronic countermeasures. The equipment has been designed to cope with small high-speed anti-ship missiles with radar cross-sections down to 0.1 m2 and approach speeds of Mach 3+, which can be either sea skimmers or arriving from high angles of 70° or more. The SMART system operates in F-Band (the traditional of this frequency band name was S-Band, the designator is SMART-S therefore), where it offers an optimum balance between range, clutter rejection and antenna dimensions. It provides automatic detection, track initiation and track maintenance of both air and surface threats, with gapless coverage over a complete hemisphere from the sea surface upwards. It incorporates anti-clutter and electronic counter-countermeasures features such as multiple reception beams with ultra-low sidelobes in elevation and azimuth, a clutter analysis sensor, broadband transmission, pulse repetition frequency and radio frequency agility per burst and a jamming analysis sensor. SMART is designed to track 160 air targets and 40 surface targets simultaneously. 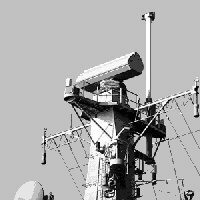 The system comprises an antenna and three main below-decks units. The hydraulically stabilised antenna consists of a single-element wideband transmitting array, and a multi-element stripline receiving array. The ultra-low sidelobe phased array allows the formation of multiple receive beams in elevation. To ensure high sensitivity, preprocessing of the received signals takes place in the antenna unit itself. The output of the 16 antennas is fed to a digital beam forming network in which the 12 independent elevation beams are produced, after which Doppler Fast Fourier Transform processing and automatic tracking is carried out. The transmitter is based on a high power, pulse-to-pulse coherent Traveling Wave Tube. Integral identification friend-or-foe can be provided.